This post has 4,748 views. In the first time in three years I was able to go back home during the summer, and of course I was very happy about being to head home during the nice, sunny summer months. This year there was an important conference in Vancouver, and my boss was nice enough to let me stay with my family for a little longer. Vancouver was beautiful as expected during the summer, and my parents and I also took a trip down south to Portland Oregon and to Mount Saint Helens and Mount Rainier in southern Washington state. I had a great time of course, and here are the highlights. The conference we attended mainly took place in the two buildings of Vancouver Convention Centre on Coal Harbor. The East Convention Centre building is basically Canada Place, and the newer West Building was built for the Winter Olympics in 2010. Both are located on the edge of Coal Harbour, which is one of the most beautiful locations in downtown and offers scenic views of Stanley Park, the Burrard Inlet, West and North Vancouver and the mountains on the North Shore. A few years ago I worked as an intern in the downtown area and so I was fairly familiar with the area, but it was still nice to be back. The weather was wonderful too: sunny, dry, and the temperature was just right. I spent some time showing my colleagues around the downtown area and took them to various restaurants. Meals are covered expenses during the conference, so of course I took my friends to decent places. I’m not going to comment too much on the conference itself, but they certainly picked a great location this year haha. Otherwise I would not have been able to travel home during the summer. I didn’t go to too many parks or tourist attractions while I was back, but one place I visited was the Capilano Suspension Bridge Park, which is a well-known tourist attraction in the area. I’ve been there once before, but that was a couple of years ago and the park has added some new attraction since then. The $30+ ticket price isn’t cheap, but a colleague wanted to go so I went along as well. The park is located in the District of North Vancouver. It’s quite close to Downtown Vancouver in terms of distance, but the Lions Gate Bridge that crosses the inlet only has three lanes in total and is therefore usually congested, and so it takes a little bit more time to get there. These days, local attractions like Capilano and Grouse Mountain offer free shuttles from and back to Canada Place, so transportation was very convenient. 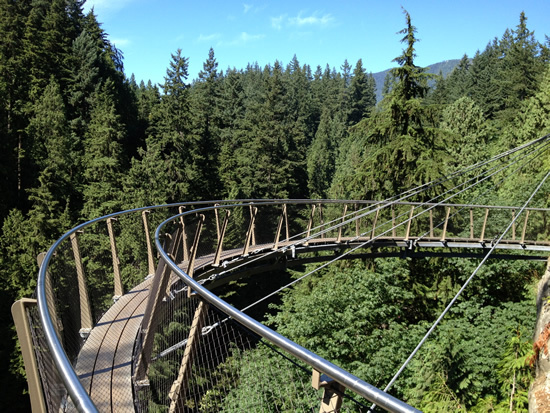 The centerpiece of the Capilano Suspension Bridge Park is of course the suspension bridge itself. 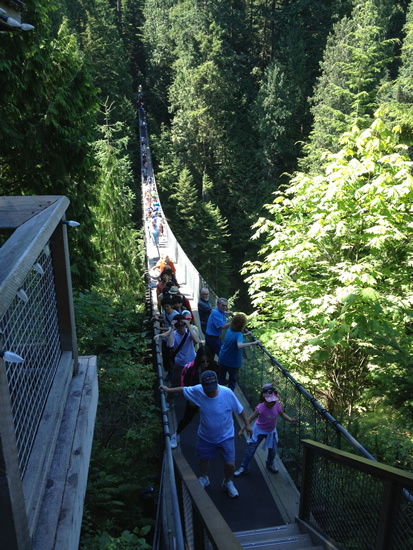 The bridge is 140m long and crosses the gorge formed by the Capilano River. The bridge is 70m above the river below, and it does shake when people walk on it. I remember a few years ago I was a little scared of the bridge because of the height, but this time I crossed it without much trouble and even stopped to take pictures of the river below. The only fear I had was accidentally dropping my iPhone into the river. It’s fun to walk at mid-tree level. On the other side of the bridge is the park’s main area which features some ponds and trails through the forest with some overlooks into the river gorge below. The forests of the Pacific Northwest are dominated by conifers that shoot up tall and straight into the sky. The featured attraction on that side of the park is Treetops Adventure, which is a series of platforms built on big trees and connected via suspension bridges. 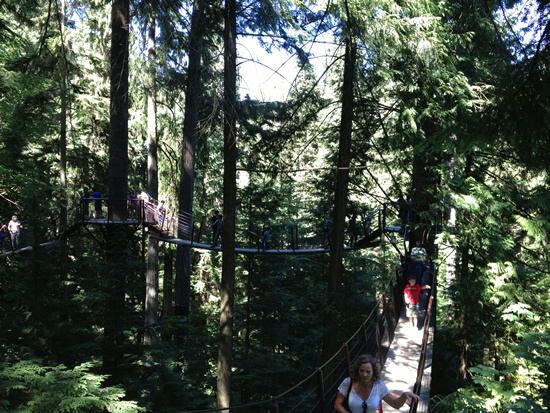 The platforms go as high as 30m off the ground and offers a “squirrel’s eye view” of the forest. I thought the walk way was pretty nice, and since the bridges are shorter they don’t shake nearly as much as the main suspension bridge. The Cliffwalk Bridge was the only part of the park that’s not crowded. Perhaps people are too scared? The last major attraction in the park was back on the entrance side of the suspension bridge. The Cliffwalk, opened in mid-2011, is a metal bridge/walkway that goes down and around a granite cliff. The whole thing is pretty cleverly constructed, and it offered a pretty fun experience walking around a cliff. Even though it’s heavily advertised, the Cliffwalk wasn’t as crowded as the other parts of the park. My colleague and I actually had the whole thing to ourselves for a while, but maybe it was just coincidence. The walkway is pretty narrow, so having too many people on it would not be advisable. Although the walkway is narrow, it’s pretty solid and the railings are high, so it felt quite safe.